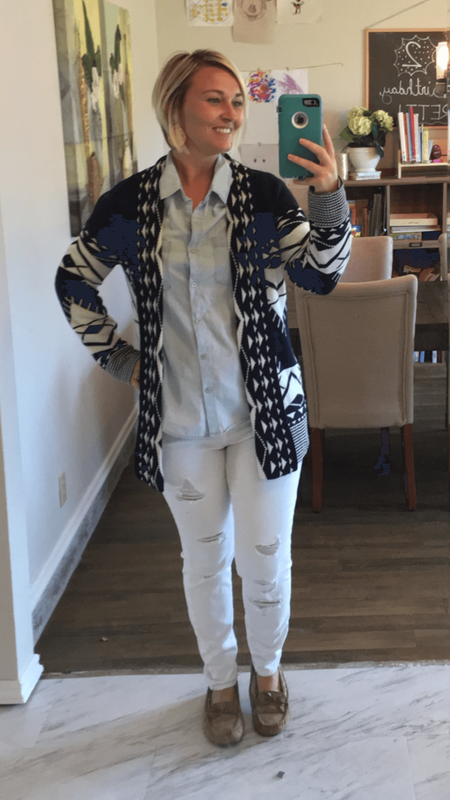 A chambray/denim top was one of those pieces I never thought I'd wear before starting this blog. Most of the women who wore it seemed to look frumpy. Plus I was stuck on "safe zone" clothes and that wasn't one of them. I'm so glad this blog has pushed me to try new things. 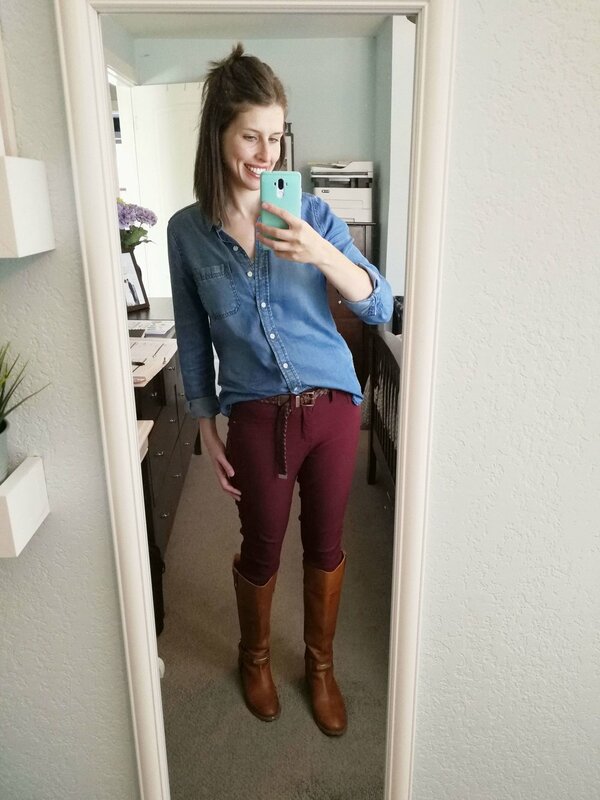 Chambray has become a favorite in my closet and I now always include a chambray top in my free wardrobe plans for moms. That's why you'll see chambray styled constantly on Frumpy Fighters (our free facebook group for moms). If you are a subscriber of our email list or have explored the blog, you may have come across a link or invite to our Facebook group Frumpy Fighters. 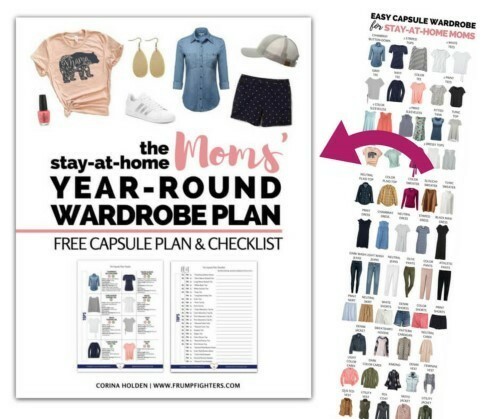 This is where members can share their daily outfit inspiration, their questions and tips on clothing pieces, as well as outfits they've created from our outfit guides! It's a wonderful little community and if you aren't already a member there, we'd love to have you join us! 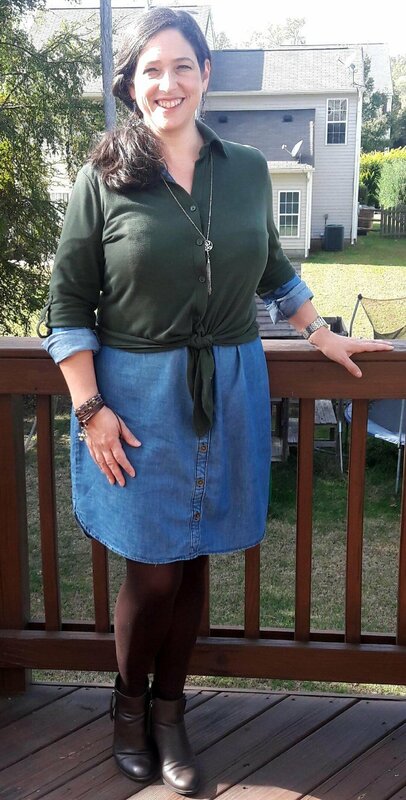 These photos below come from members of our group who fearlessly accepted our challenge to style chambray in cute, mom friendly outfits. Before we get started, though, here's a basic intro to chambray. Unofficially, it's the blue in the pictures below :) And it's a trend that's been going strong for several years. In my opinion it's one of the most mom-friendly trends out there! You might know chambray as those denim-looking button down shirts everyone wears. Well you've probably either seen them worn the same way over and over, or just plain frumpy. In this post, we're going to convince you that chambray (whether in a top or dress) belongs in your mom wardrobe! It's extremely versatile and durable! Chambray is most commonly found in tops and dresses. However you'll also find it in headbands, shorts and even sneakers! It's similar to denim, but a much lighter type of fabric. It comes in all shades, from very faded blue to dark blue. Dresses should either be cinched (many come with this built in) or worn with a belt to add definition. Only wear chambray with denim (jacket or jeans) if they are opposing shades. 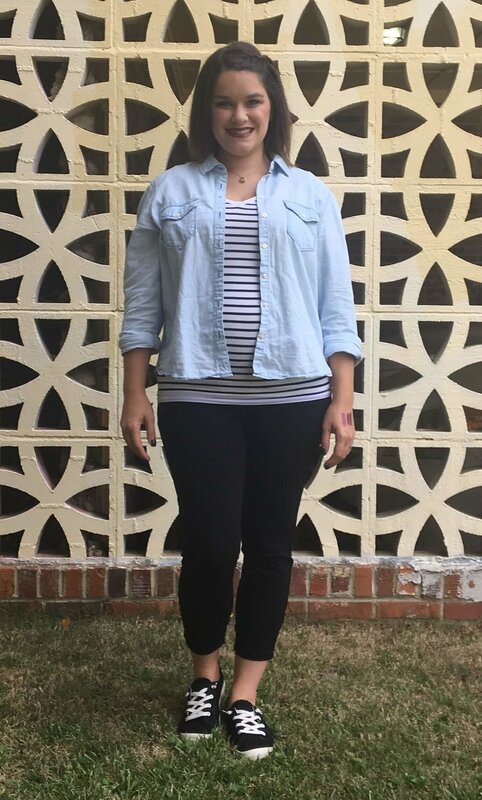 For example: A light chambray top with dark wash skinny jeans works great! Credit: Laurie from Frumpy Fighters. 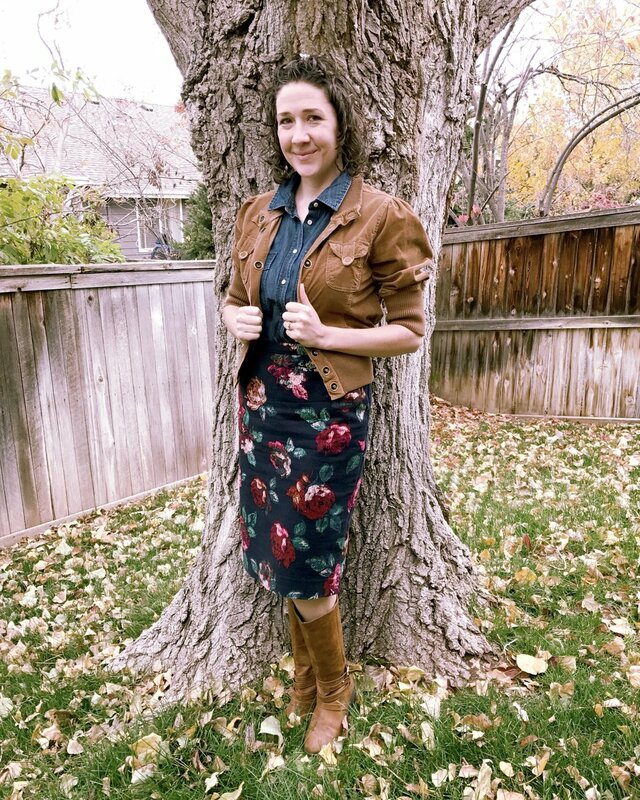 Click for outfit formula. Same outfit! :) Click for outfit formula. Credit: Carrie in Frumpy Fighters. Click for Outfit Formula. Credit: Dana in Frumpy Fighters. Click for Outfit Formula. Credit: Laurie in Frumpy Fighters. Click for outfit formula. Credit: Amanda in Frumpy Fighters. Click for Outfit Formula. Credit: Johanna in Frumpy Fighters. Click for outfit formula. Credit: Mary in Frumpy Fighters. Click for Outfit Formula. Credit: Lorena in Frumpy Fighters. Click for Outfit Formula. Isn't it crazy how many ways there are to wear a chambray top?! Now it's your turn to share... what do you think about chambray? Have you always loved it, never worn it, or just can't find one you love yet?